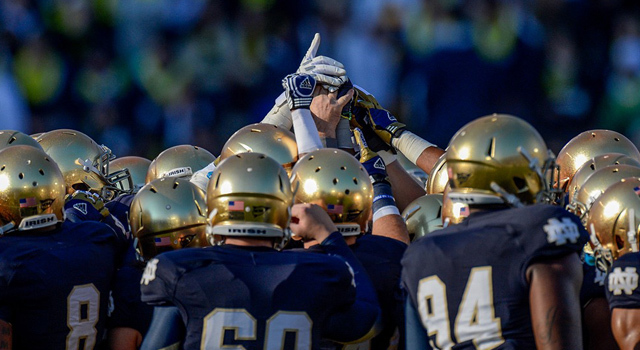 DIRECTV continues to break new ground with 4K broadcasting, announcing that they will be broadcasting every single Notre Dame home game in both 4K and HD. HD coverage will be on local NBC stations, while 4K coverage will be on channel 106. The two broadcasts will be identical except for the quality, featuring the same commentators and camera angles. This is possible because NBC, who is producing the games, will be using 4K cameras whenever possible. This is becoming more and more common in sports so that it’s possible to zoom in on plays and still retain HD quality. Of course, just like all other 4K programming you will need an HR54 Genie DVR and either a DIRECTV 4K ready smart TV or a DIRECTV 4K Genie Mini Client. If you don’t have either of these, now’s a good time to call Solid Signal at 877.312.4547 to get set up. Our consultants will also make sure you’ll get the new satellite dish that will be required for 4K broadcasts in the future. This is yet another case where DIRECTV is showing leadership in broadcasting. Other pay-TV providers are just starting to show 4K programming and only DIRECTV has three full-time channels of 4K content, plus hundreds of 4K titles to download. No one else is even close. If you love college football, you’ll soon realize that 4K is the only way you’ll want to watch it. It won’t be long before the entire season for every team is in 4K… don’t you want to be ready? Call Solid Signal today.